These sweet candied pecans get a little holiday kick from Sriracha. TAHOE-TRUCKEE, Calif. — These roasted pecans can go two ways — into your stomach or into gift bags for friends. I love candied nuts any time of the year because they are a perfect way to dress up salads, pancakes, yogurt — anything but soup. That just defeats the whole purpose. They get soggy and you are right back to where you started, meaning a soft nut. Usually I just go with honey and salt to candy walnuts or pecans, but this year I wanted to spice it up a bit. Just a bit. No red pepper, which I have used in the past, and the heat proved a bit overwhelming. 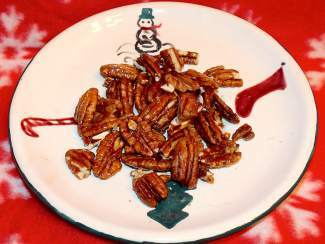 The dusting of sugar added at the end is optional, but if you are serving these pecans as a snack on your holiday table I would go that way. I recommend you double the recipe and wrap some up in festive tissue paper to hand deliver to friends and family. I say hand deliver because you did, in fact, miss the date to mail them for a Christmas Day arrival. Preheat oven to 300 degrees. Line a cookie sheet with foil and then spray the foil with non-stick cooking spray. In a large bowl combine honey, butter Sriracha, water and salt. Mix until combined. Next, gently stir in your pecans and, using your hands, mix all to make sure the nuts are thoroughly coated with the honey/Sriracha mixture. Pour onto your cookie sheet and spread out in one layer. Bake for ten minutes. Remove from oven and turn nuts over. Return to oven for another ten minutes. Remove and flip nuts over again. Bake one last time for ten minutes. Remove to plate and let cool. Sprinkle with sugar when nuts are entirely cool.